It was time to bring this 1980s contemporary kitchen up to current times. 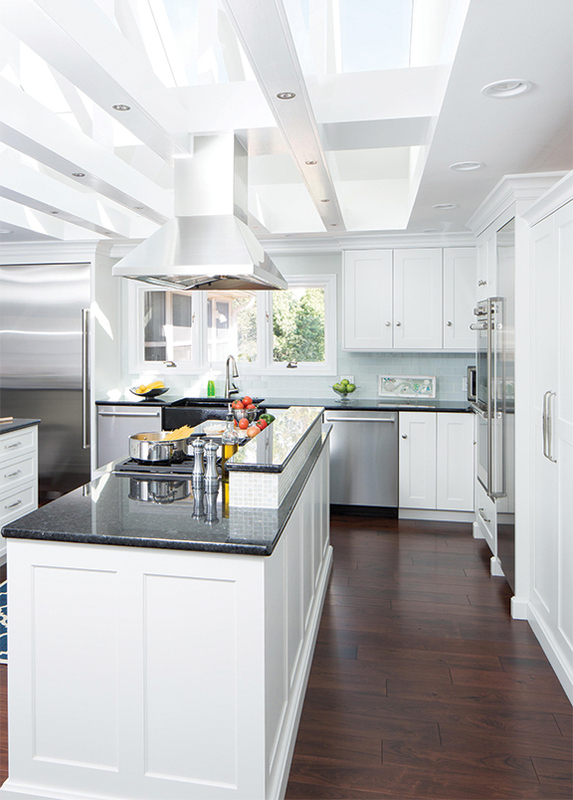 Gegg Design & Cabinetry worked with the homeowners to improve the functional flaws of their previous space. While no walls or windows were moved, this was a major transformation of the kitchen. Gone are the curved corners, mirror backsplashes and gold accent channel doors. One great feature that stayed is the large skylight in the open beam section of the ceiling. This feature helped the room feel taller and was enhanced with LED lighting to illuminate the space at night. The biggest challenge in the kitchen was making use of the large space. This was done by breaking up the functions and rethinking the space. The pantry is located along the back wall using full-height cabinetry. A separate refrigerator and freezer in different areas give easy access to the refrigerator, which needed to be centrally located for access to the kitchen and breakfast room. The sink remained at the window and became the cleanup area. The kitchen features a two-island design. One island includes the range top with the prep sink on the other island. The prep island is T-shaped to allow for seating and interaction with the cook. The cabinetry is frameless with recessed panel doors in a white-painted finish. Stainless steel appliances and a glass tile backsplash provide a fresh new look that will carry the kitchen forward for many years. This is an amazing transformation. 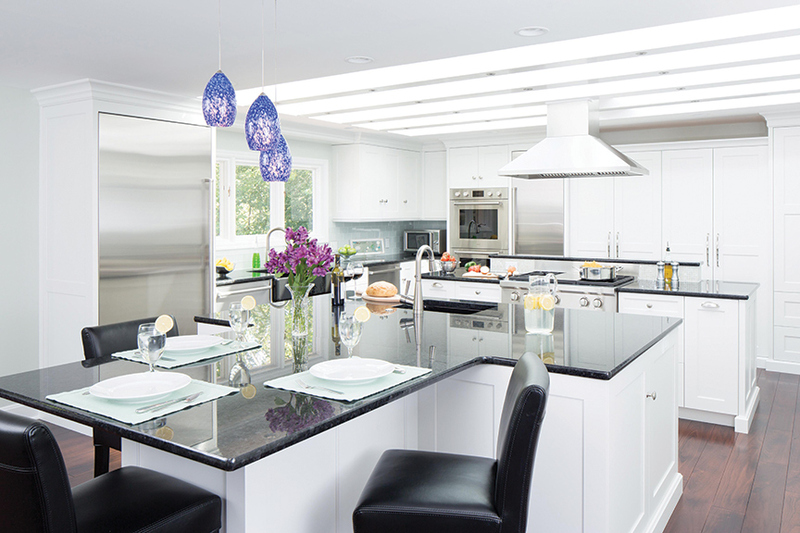 Clean, and bright, this kitchen is well thought out. We love how the designer took an architectural element that is 30 years old and updated it to stand out in today’s design.